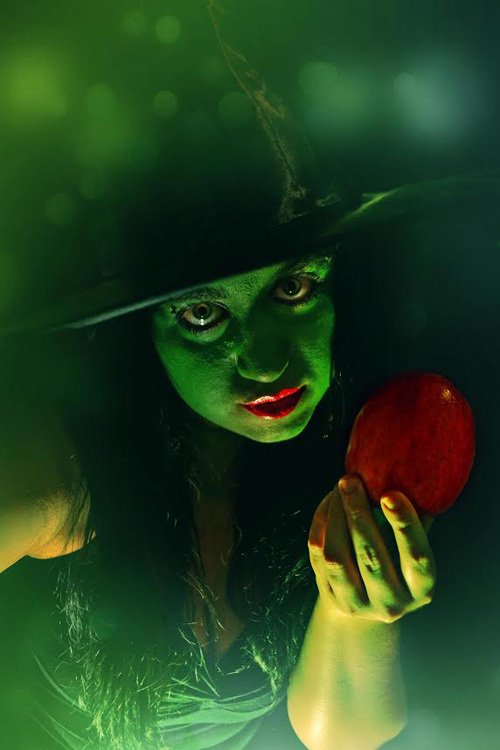 Some of us Geek Girls put this post together with our favorite scary or dark cosplays for Halloween! There's 2 photos from each girl and a description of the cosplays or concepts! Have a spooktastic Halloween my geeky friends!! "Hey guys, so Halloween is my favorite holiday, it is basically my Christmas and birthday in one lovely package. 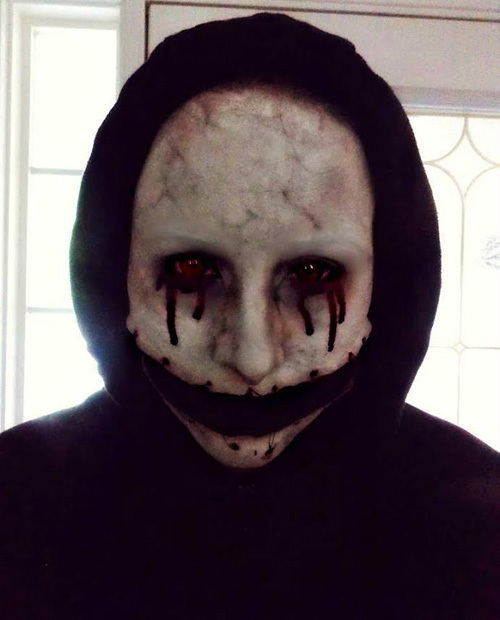 I actually got into makeup (Which is my career now) because of Halloween, I would do insane get ups every year and continue to challenge myself on how much I could scare the neighborhood kids. I love decorating the house and getting into the spirit of the holiday.� These images are some of my Halloween looks from past years :) The Demon White was one of my absolute favorite scary makeups I have ever done actually hehe. Hope you enjoy and Happy Halloween, get your scare on!" "As my namesake, Rogue has always been one of my favourite characters. This year for the Toronto Zombie Walk I thought I'd tear up an older make of my Jim Lee Rogue and put together Zombie Rogue, which technically could be considered canon with the Marvel Zombie series! 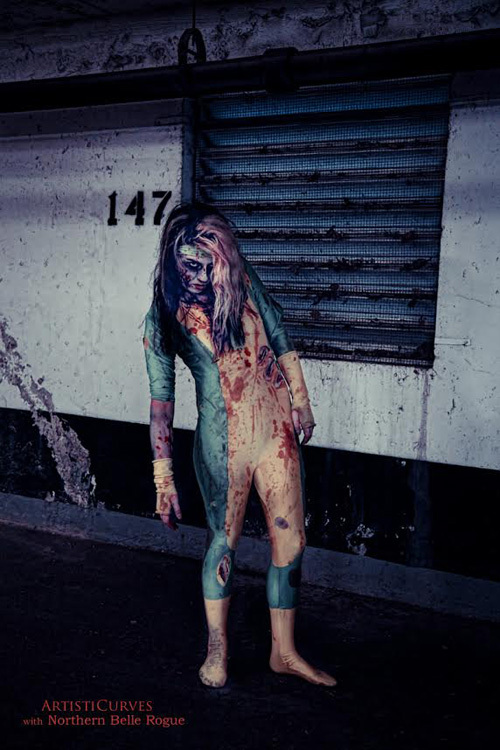 How crazy would it be if Zombie Rogue not only had a hunger for brains but kept her powers? Could she absorb more 'zombieness', would she eventually become Queen of the zombies? It was a lot of fun groaning and shuffling the streets as well as pondering these theories. 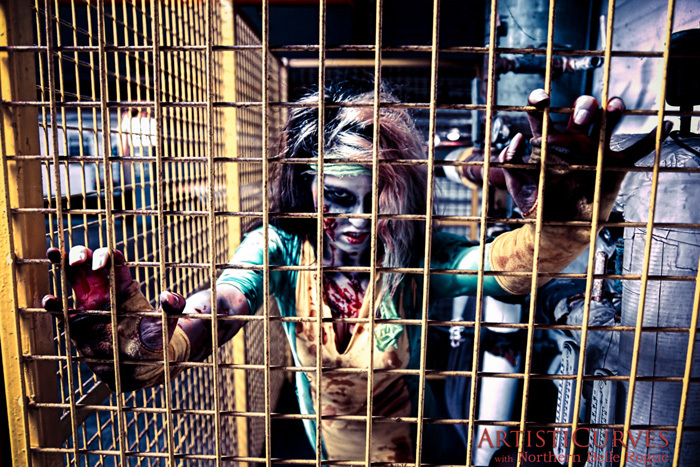 Of course special thanks are owed to Jim of ArtistiCurves for not only zombifying me, but doing a mini shoot before I headed to the event. Here's a couple shots from the series, hope y'all enjoy! Have a Happy Hallowe'en and a Merry Samhain! Regards, Rogue"
"Photos were taken an edited by me, my cosplay page is here. Hey, so this was a last min decision, I had originally planned to reshoot my Resident evil, alice from the 4th movie, but I didn't have time, so I decided to try something different.� I haven't done a lot of make up things so I thought that it might be fun to try something new.�� I decided to do a green witch make up, one of the reasons was The Wizard of Oz is one of my favorite movies when I was growing up.� I originally had a prosthetic nose, but it wouldn't stick properly so I ended up just using my own nose.� I really enjoyed doing something different and outside my usual comic cosplays. I�� Hope everyone has an awesome Halloween, be safe and have a blast!!" 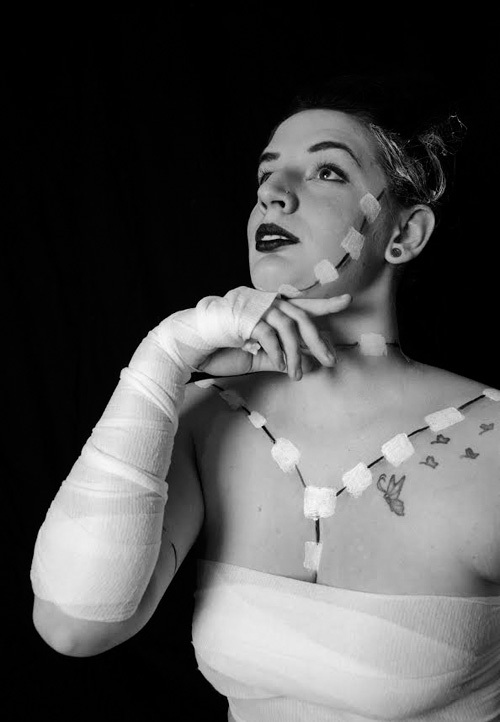 "This Halloween I decided to put some of my body issues aside and shoot a Bride of Frankenstein pinup shoot inspired by artwork from Petri Arts!!" 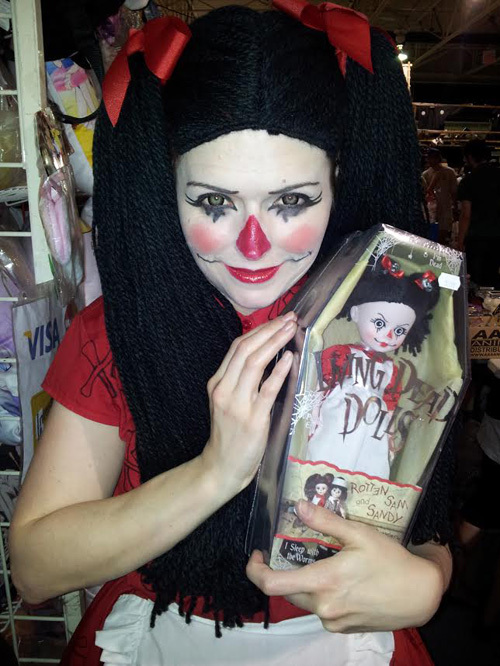 "Living Dead Dolls are a great source for creepy costume ideas. 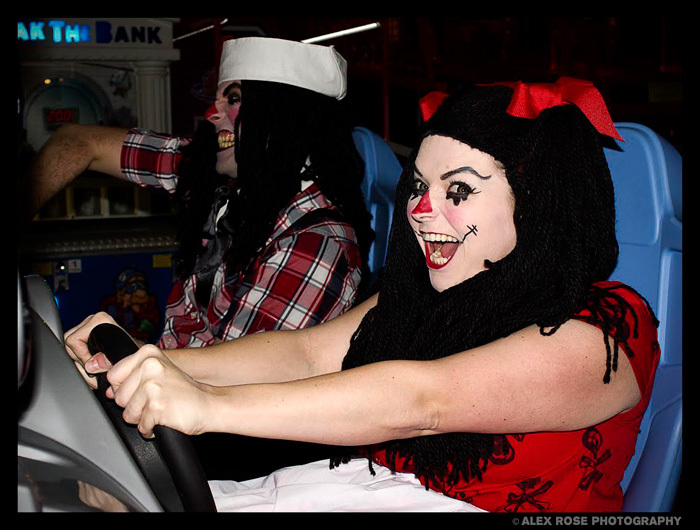 Retro Joad and I decided to do Rotten Sam and Sandy, the dark take on Raggedy Ann and Andy. These costumes are a ton of fun to wear, as we run around pushing each other and acting like five year olds. Both costumes were put together and made by me and I think my favourite part about it is my wig that I constructed almost from scratch. Also the doll eye contacts freak the heck out of people." 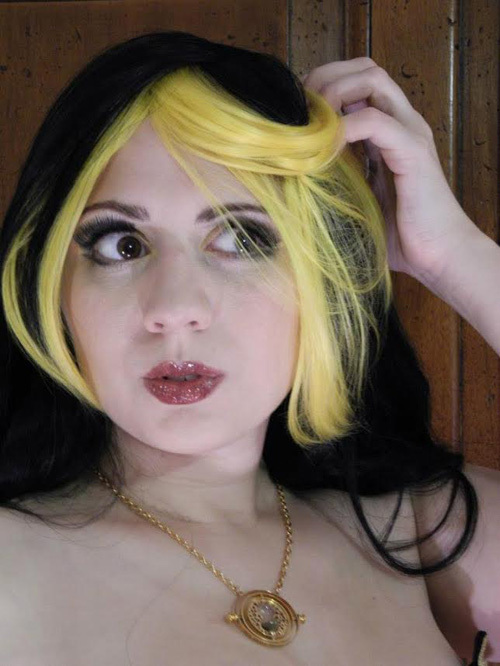 "'Witch' has certainly been given a different sort of feel between when I was a kid and now.� Harry Potter gave us a whole new outlook on witches.� This was a loosely based on Helga Hufflepuff outfit.� The wig is one of a limited edition wigs from Arda Wigs as one of four Wizarding Wigs which I bought all of of course because I am a Harry Potter nut! !� My house is Slytherin but this wig looked better on me so I decided to go with it and build around it. Black and gold is a lot of fun. 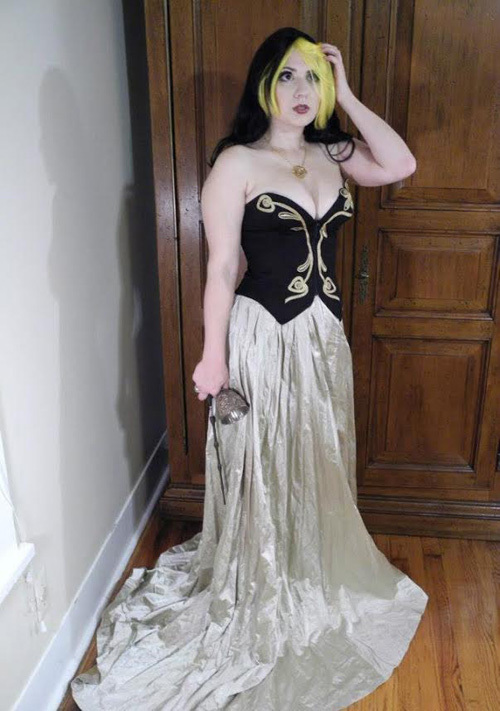 The skirt is an underskirt from the Legend of the Seeker Salindra princess dress I have, the corset was my mom's in the '80s, the time turner piece replicated from the film was gold so I thought it was fitting with the black and gold theme. From there I just got a little silly and thought as long as I am stepping out of my own house let's mix everything up and I like alliteration Helga Hufflepuff Horcruxes and Hallows.� I have the wand which is a Hallow and the cup which is a Horcrux. My little sister's best friend did my make up and it was fantastic in black yellow and gold. Hopefully we will get to play with the other wigs for the other houses and piece together some more outfits sometime soon." "These photos are from a shoot I did awhile back with photographer Cris Jan Lim. He was shooting a series of horror portraits and I had this really cool ghostly lingerie that we destroyed with blood. 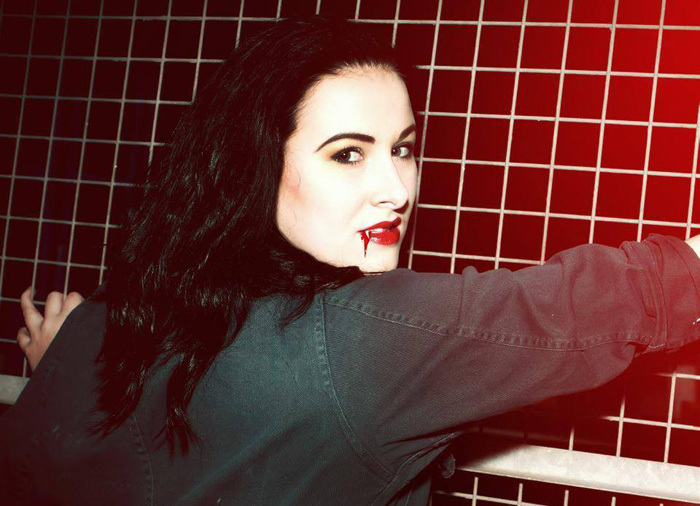 I love the Carrie vibe and the makeup artist (I unfortunately do not recall her name) did an awesome job making me look pale and scary - love the red eyebrows! 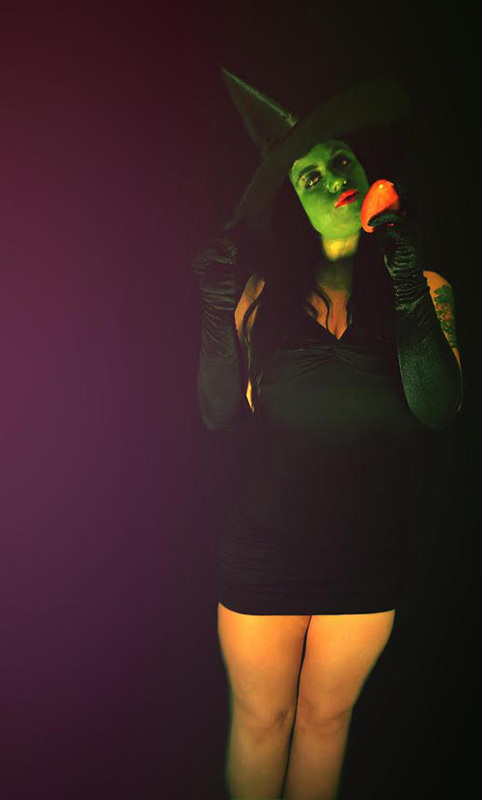 He's one of the best horror photographers in Los Angeles. It was the only time we've worked together but they are still some of my favorite shots :)"
HAPPY HALLOWEEN, STAY SAFE AND HAVE FUN!! !